This IBM® Redpaper™ publication was produced by the WebSphere® Business Process Management performance teams. 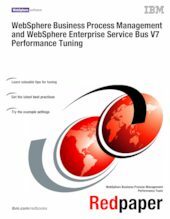 It provides performance tuning tips and best practices for WebSphere Process Server 7.0.0.1, WebSphere Enterprise Service Bus 7.0.0.1, WebSphere Integration Developer 7.0.0.1, WebSphere Business Monitor 7.0.0.0, and WebSphere Business Modeler 7.0.0.1. These products represent an integrated development and runtime environment based on a key set of service-oriented architecture (SOA) and business process management (BPM) technologies: Service Component Architecture (SCA), Service Data Object (SDO), and Business Process Execution Language for Web Services (BPEL). This paper is aimed at a wide variety of groups, both within IBM (development, services, technical sales, and so forth) and by customers. For those who are either considering or are in the early stages of implementing a solution incorporating these products, this document should prove a useful reference, both in terms of best practices during application development and deployment, and as a reference for setup, tuning, and configuration information. This paper provides a useful introduction to many of the issues influencing each product's performance, and can serve as a guide for making rational first choices in terms of configuration and performance settings. Similarly, those who have already implemented a solution using these products might use the information presented here to gain insight as to how their overall integrated solution performance might be improved. All of these products build on the core capabilities of the WebSphere Application Server infrastructure, so BPM solutions also benefit from tuning, configuration, and best practices information for WebSphere Application Server and the corresponding platform Java™ Virtual Machines (JVMs). Pointers to this information can be found in “Related publications” on page 67. The reader is encouraged to use this paper in conjunction with these references..